Impress your friends and family with these little bites of heaven! Crunchy and extra chocolatey truffles, stuffed with crushed biscuits and crispy walnuts, flavoured with cognac and dredged in chocolate sprinkles.. Best of all, ready to fridge in less than 10 minutes! Oh and you can always read this in Greek if you fancy Συνταγή για εύκολα Τρουφάκια σοκολάτας σε 10 λεπτά! To prepare the mixture for the chocolate truffles, start by melting the chocolate. Chop the chocolate in small pieces and melt over low heat using a Bain Marie or double boiler, being careful not to burn it. In the meantime, crush the biscuits in a large bowl. Pour the melted chocolate over the biscuits and (using a wooden spoon) blend to coat. Add the chopped walnuts, the milk and milk cream and blend again, until the ingredients combine. Pour in the cognac and place in the fridge to cool for 1-2 hours. Remove the mixture for the chocolate truffles from the refrigerator. 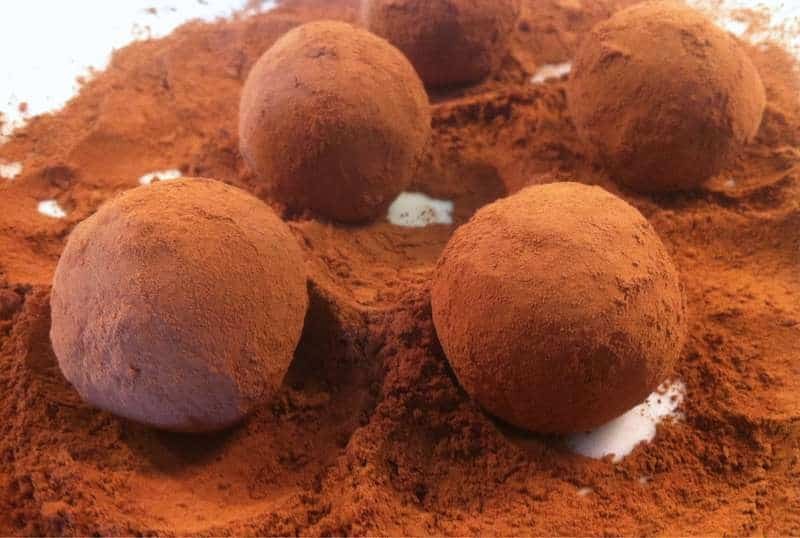 Wet your hands with some water, to make it easier to work with the chocolate mixture, and shape the chocolate truffles into balls by rolling between the palms of your hands. Roll the chocolate truffles in cocoa powder or chocolate sprinkles and serve, or place back in the refrigerator until needed. Enjoy! can you replace the cognac/ brandy with anything else non-alcoholic? Yes absolutely. Instead of the liquor, you can replace with orange juice or cherry juice. Either one actually is really good in chocolate. I used Metaxa – scrumptious!